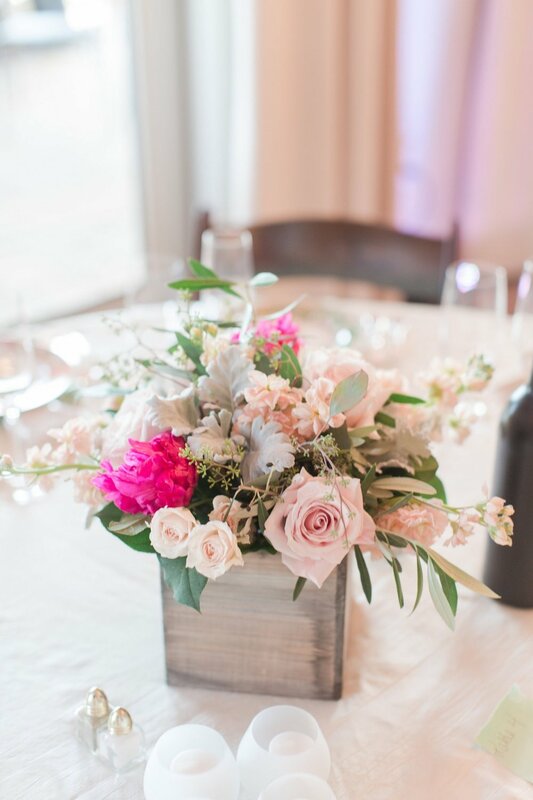 Centerpiece in a raised, gold, mixed metallic vase at the Red Fox Inn and Tavern, Middleburg, Virginia, Photography by Candice Adelle. It’s time to revisit centerpieces. These are the central elements of your table and the flowers most visible to your guests. If you are planning a big wedding, your centerpieces may account for a considerable amount of your floral budget. So that means they have got to be gorgeous, right? There are a couple of important decisions that you will make when designing your centerpiece. 1. It’s all about that vase. I say it all the time, and I appreciate the fact that Meghan Trainor put my sentiment to music (someone once tried to tell me that she was actually saying “bass”). The vase or container for your centerpiece is a significant part of your overall décor and helps us define your style. There are so many variations that we can create with vases and floral but, in general, some of the most popular containers envisage a certain style. The list goes on and on. In the early part of your conversation with potential florists, you might want to consider asking about the style of rental that you are interested in comparing their inventory to your décor plans. Every bride knows the rule. An arrangement can be no higher than the length of your elbow (as it rests on the table) to your fist. This makes the arrangement no more than chin height. Conversation among guests across the table brings the volume of the room up, indicating to you that the group is having a good time. A tall centerpiece allows space below for conversation and raises the level of the decor. Oatlands Historic Gardens, Northern Virginia. Photography by Tony J. Tall centerpieces are put in clear or thin metal vases to protect that conversation space. They look so elegant above the tables and raise the floral elements for all to see. We have been working on some designs for these arrangements that are a little smaller in diameter creating a few different price points. Loose greenery in both short and tall arrangements helps to achieve that English Garden style that is becoming more and more popular. 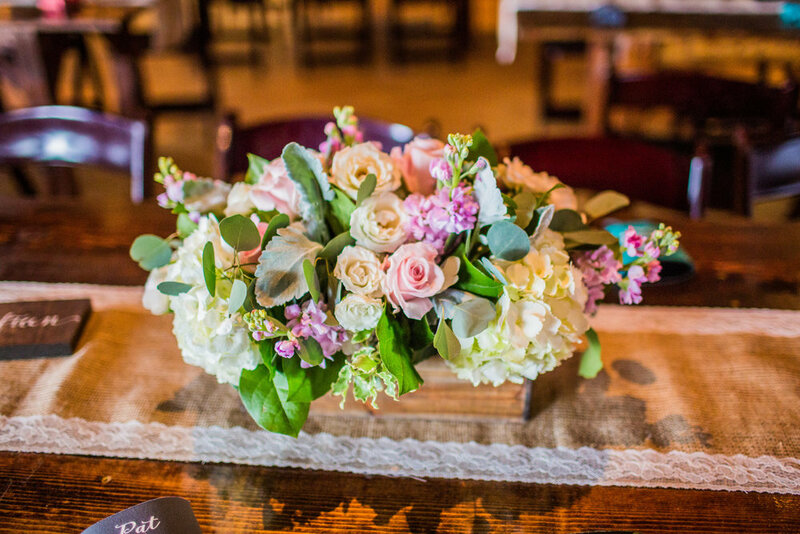 This bride's favorite flowers became the focal point of her arrangements. Silverbrook Farm, Virgina. Photography by Purple Fern. Single color floral looks luxurious at Oatlands Historic Gardens, Virginia. Photography by Tony J. The flowers in your centerpiece pull all of the elements of your wedding together. It’s like the moment in charades when you abandon your single-word strategy and signal your team that you will now act out “the entire concept.” Your centerpieces allow us to help your guests see what you are accomplishing with your color palette. That doesn’t mean they have to be full of accent color. We can continue to work with your ivory and green (a very soft and elegant look) exclusively, or add just a little soft peach to create a focal point for the most important blooms. If your wedding is colorful, then we talk about the blend of color that you hope to achieve and balance the arrangement so they are visible from every angle. The goal in a mixed arrangement is to create a design where the eye is drawn to your signature flowers. However, single color floral communicates luxury. We can use different floral varieties in the same color and create focal points by contrasting the textures. This array (bowl) and compote make an elegant duo in mixed metallic. Meridian House, Washington, D.C., Photography by Love Life Images. We like the idea of creating two or three styles for your centerpiece with your theme flowers. We have a lot of containers within each style in different sizes and shapes. We could use a low wooden box on some tables and a small square box with colored glass and bud vases on the others. We can create three centerpiece styles as well. Imagine a trio of centerpieces including mixed metallic raised pedestals, bowls and a tall candelabra on a third of your tables. We can also vary the look of your decor by adding a few smaller floral accents to the table creating a grouping. This feels luxurious but it’s really a little deceptive. Floral accents can be done for $20 to $40 and, as I have said before, we can use your signature flower to make sure you really see the flowers you love.